Filing your tax return conveniently online requires a working SARS eFiling profile (even if you are using TaxTim). A prerequisite for this is that SARS has your latest correct banking details stored in the SARS eFiling system. 2. 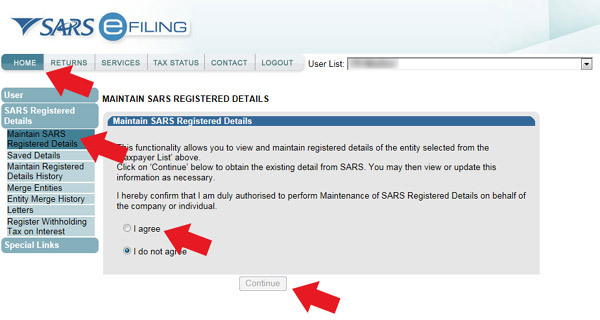 Click on Home -> SARS Registered Details -> Maintain SARS Registered Details. 3. Click on 'I agree'. 4. An Adobe form will open up showing your SARS Registered Details. If you do not see the Adobe form, you will probably need to get the latest Adobe plugin working in your browser. You can also try logging into eFiling on a different web browser - like Internet Explorer, Chrome, Firefox or Safari. If you cannot in any way get this form to load, please call SARS on 0800 00 7277, or write into the TaxTim helpdesk. 5. Click on the 'My bank accounts' tab. 6. If there is no bank account listed, please click on the 'Add bank account' or 'Bank account settings' button in the top right hand of the form. 7. 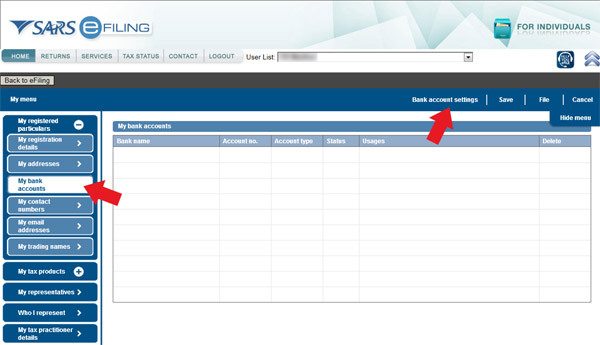 You will need to follow the various steps involved from there to add your latest bank details and then click 'File'. What follows is a verification process. SARS will either notify you immediately that your bank details are ok, or they will tell you that you need to come into your nearest branch to verify your banking details. They may also send you an email some time later about verifying your details. There is also a chance that you will not hear from them - if you are unsure of the status of your stored banking details you can try logging into eFiling again in 24 hours time and following steps 1 - 4 above, or phoning SARS on 0800 00 7277. Tell them that you have recently added a bank account to the SARS Maintained Details section of eFiling and want to know if the details are verified. 1. Follow steps 1 - 3 above. 2. You should immediately see your registered details page. If you do not, and instead see a page that asks if you want to see your LATEST details or your SAVED details, click the choice that is appropriate to you. We suggest to view the SAVED details if you have just entered new details recently. If you then view SAVED details, please navigate to the bank details section and click the 'File' button. After all this, repeat the steps above until you see your registered details page with bank details saved correctly (no more LATEST / SAVED page in between). Then you are ready to proceed with TaxTim.